@Trent Great stuff, I wanted to do something similar with Dortmund, e.g. signing only German home-grown or very young talent and see if I can slowly but surely build a dinasty, even though now I'm still unsure whether to pick them or Bayer 04. Will follow your progress! @Trent71 I've been considering abandoning my Freiburg save to do something similar...would definitely have moved for Pavard though. I'm surprised you sold Lewandowski too, possibly the best all-rounder centre forward in the game. I guess you're going for a Poacher or Pressing Forward if you're using Müller and Werner? Yeah, Lewandowski has been wanting a move for awhile and hence why I moved forward with selling him. Ideally, I always look for a forward with bags of pace (possibly younger than 25yo). With Muller we'll see if he's best suited up front or on the wings, I'll probably be shifting things in attack if he doesn't do well. Our tactic for the upcoming season will be TFF's Punisher, as I want to try something else than the 4-3-3 (with 3 DMCs) I've been using lately. The first official game was won in quite a style, as we turned a 2:0 deficit at half time to a 2:3 win. Muller didn't have a lot of luck in front of goal, but Zirkzee made a name for himself when the 17yo substituted Thomas after an hour of play! I am a bit taken aback by the lack of decent German players alround. 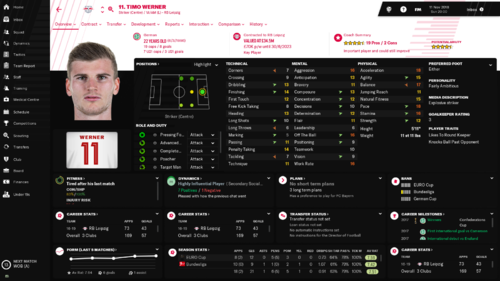 There's probably 3-4 decent picks for left back (I originally thought to go for Hector, but my scouts reported on him after I already signed the other two ), but on the right back there is just one decent kid from 2nd Bundesliga that's rated well and that's about it. His agent was a bit of a twit during negotiations, hence why it broke down, but I'm confident I'll bring him in before the Summer transfer window closes. I think he was from Hertha or another one of the decent teams that relegated (Hamburg?) but I'll post about him for sure once the deal is sealed. With the first 22 players selected, we're still sitting on a 250M transfer budget and a 1M to spend in wages. It's nice to know we have the potential to bring Cristiano Ronaldo, though on this save I'm thinking more about Joao Felix - to see what the fuss is about my biggest concern is the center of the midfield and how will it hold, but the plans are to bring in Kante or Rabiot should we show disappointing results. I think he was from Hertha or another one of the decent teams that relegated (Hamburg?) but I'll post about him for sure once the deal is sealed. You probably mean Vagnoman from Hamburg, 17 yo and very nice prospect. Horn from Köln is also a good prospect as left FB. Maybe not for Bayern but for any other team I'd check also Gonens at Atalanta, a German 23 yo decent FB and you can have him for around € 7/8M. Then on the right you have of course Mitchell Weiser at Bayer 04. Decided to play the first matches up to first international break with both Dortmund and Bayer (with the idea of only buying or developing home talent) and see what inspires me most. Dortmund for funbase, Bayer to overturn the treble of horror and land a Bundesliga title for the first time. WOW....you have seriously damaged the squad of Bayern, bringing in some quite frankly underwhelming players IMO. Each to their own of course but not what I would have done with that squad. Good luck. I've always been one for experiments and and trying new things - Fellaini as SC? Alaba in the center of the midfield? Sergio Busquets (and a number of other DMC/MCs) as DC - you name it, I've done it. Also, I'm not sure if you've noticed it, but on a lot the stories you read on here, it's always the same players picked - different managers, always the same (or close to) the same "top starting 11" that are picked up overtime during the transfer windows. I always go for the underdog! You probably mean Vagnoman from Hamburg, 17 yo and very nice prospect. Yes, yes! Vagnoman is part of our team now, as he signed for 11.5M Euro. Just a week before deadline day, Ribery also got an injury and I was left thinking - do I really want to rely on Robben/Ribery and their injury proness? I had to do a bit of thinking and throw some bids around - for Rodrigo (Valencia), Zivkovic (Benfica), Oyarzabal (Real Sociedad) and I even wondered about bringing back Mandukic, but 30-40M Euro for a 32yo is a bit of a no-no in my books. My 130M bid for Hazard was rejected too...though that was just for a laugh. 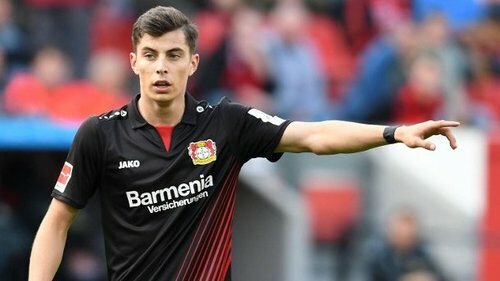 The man, the myth, the legend - Kai Havertz. Even though Leverkusen were reluctant to sell, 80M Euro persuaded them otherwise. We've got a great player and one of the top German prospects atm. We've started the season well with 4 wins in 4 games and we're looking forward to the CL group consisting of Liverpool, Basel and Celtic. Should be a walk in the park up until December (hopefully!). At least your staying true to Bayern Munich ways and making sure the (Potential) rivals lose their stars/future stars to you. Anyways, I'm desperately in search for a long-term save. I've had some short terms one, but nothing clicks thus far. I'm mostly interested in a Serie A or Bundesliga one. Currently, I'm thinking of three clubs. Dortmund: Obviously the closest to toppling Bayern. The focus here would be kind of what they did with many players like Dembele. Buy them cheap, sell them for loads and then do the same with the next youngster. Of course, long-term, the goal is to be able to keep these players. Looking at the exciting prospects like Sancho, Sergio Gomez and Zagadou. RB Leipzig: Of course a totally different one from the other two. However, looking at players like Forsberg, Werner, Kampl and prospects like Upamecano, making history would be the goal. Hope you guys have advice and can guide/point me towards a good choice, since I'm struggling with picking one. Suggestions are always welcome of course. Udinese could be considered similar to Leipzig in terms of having the feeder clubs, but without the corporate branding. Obviously initially Watford would be considered a bigger draw, but quite often they go down 1st season and then you can sign the likes of Roberto Pereyra, Abdoulaye Doucouré etc. for free. This is the Bundesliga thread though so with the three above what I'd say is that Dortmund are great fun, I've managed them myself. But Leverkusen are really the middle way - they're a company club but from back when that was how clubs got started (they were the works' team for Bayern), but also have shockingly bare trophy cabinet (one DFB-Pokal, one UEFA Cup, a lot of runners up medials from the early 2000s), and like you said there are those prospects. Also I think their finances might be one step below Dortmund - its incredibly easy to keep hold of those young players, I think I had £100m transfer budget in the second season. Great signing! In game Havertz has the potential to become the best 10 in the game and could be easily retrained in a AMR-Trequartista kind of player à la Messi. Need mentoring to improve his personality though. I posted a similar question to yours just a couple of post above. I was undecided between BVB and Bayer so I started both saves until the first international window, just a couple of official game to have the feeling of the clubs. And boy, it's a tough choice. Such an iconic club Dortmund, even though it would be easier starting with them would be nice long-term to, say, win 6 or 7 straight title to replicate the current Bayern dominance. Bayer is different, you got an already developed but young Brandt, one of the hottest prospect in-game in Havertz, wonderkids such Bayley surrounded by other players. The squad isn't huge and besides a left FB you can avoid signings in the first window and keep the money increase your wage structure or reinvest heavy after first season. But what is the ultimate goal is to achieve a Treble and exorcise what happened to them in 2002. An almost empty cabinet trophy and no Bundeliga to your name is a nice play to start. Being Italian, even though it's the Bundesliga thread, I'd suggest you to take a look at the Fiorentina squad for Serie A, it's one for an overachievement for me with the right set up. PS: Got busy at work so still haven't finished my testing run so I'm still on the process of making out whether to go BVB or Bay04. How does that work nowdays? Previously it was kinda easy when it was just player to player, but now with the groups, I'm kinda demotivated to mentor anyone at all. I'm sure there are threads where everything is well explained. But now you have to create group of players. There needs to be at least 3 player in a group and of course at least one Team Leader/High Influence player with good personality. The mentoring screen tells you how much an impact a player has on the group. Personally I create 4 groups, one per each line (GK, Defs, Mids, etc.). It's slower but in a way more realistic than before. So, after much pondering I finally decided to go with BVB, couldn't resist to manage such an iconic team. The idea of the save is focusing heavily on developing home-grown talent from within the club or by buying young German prospects. I am not putting myself strict rules, but when a player needs to be replaced the order of importance for finding his substitute would be: 1. From within the club, 2. A German young talent; 3. A young talent playing in Germany; 4. Foreign young talent playing in another league (probably U21). First order of business was to overhaul the backroom staff and hire good coaches with at least a fairly professional personality. This included signing one of the best HOYD in Filippo Galli - one of the rare model citizens. In terms of players Guerreiro joined Bayern for € 22M and Schmelzer left for the Chinese Super League. This made me buy four new fullbacks, Gonens from Atalanta will be first choice left FB and Horn from Köln as backup. I thought of the future by securing two 17 yo FBs: Vagnoman from HSV and Asta from Augsburg - for the moment they are in the U19 squad and probably be loan out next season. During my test save I had developed a 4-4-1-1 system with two DMs that includes the use of a Segundo Volante. Delaney is perfect for the role but I found myself struggling fitting Weigl - so put him on the transfer list and City came in with a € 28M offer. He was replaced by Van de Beek, whom I found that, even though not 100% natural in the DM position, has all the attributes of the all-around midfielder that a Segundo Volante requires. I don't like Alcacer, as he's not ideal for playing the DLF-s but his transfer being hard-coded after the loan, I'll have to wait next season to replace him, ideally with Johannes Eggestein from Werder. So my starting XI looks like this - Pulisic doesn't start as he's on loan from Chelsea and leaving us soon, want to develop Sancho as much as possible. Season started well, it included a last minute winner against RBL by Götze and a goleada against Hannover. Hope to update you soon on my progress. We've been overall steady in terms of results, but with a bit of a twist - as I made the poor decision to use my backup 11 for the first 3 CL group matches, we registered a 2:6 loss against Liverpool, 1:0 win against Basel and a 3:0 defeat against Celtic....obviously not everyone is cut out for this level and I made the decision to use the best 11 for the remainder of the CL games, which started with a decisive 3:1 win against Celtic, that could've been far bigger, if we had more luck. Player-wise, Sule started throwing tantrums for a new deal, but if I'm going to give 200K Euro per week for a defender, he won't have the agility of a trolleybus! Hence why I rejected his aspirations and started looking at a new CD - possibly Gimenez, Skriniar or de Ligt...we have time 'till the January window. Sanchez also wanted a new deal and was rejected, so now he's in the first team without making any apps. On the bright side, Timo Werner may not be the most often of scorers, but when he does, they're always belters/golazos! What a player! 7 goals in 8 starts (+4 as sub), and he's probably going to be the first choice striker now, seeing how I struggle to fit Muller in this formation - Thomas has only scored twice and he's borrowed Harry Potter's cloak of invisibility for about 80% of the games he's appeared in. And just as I write that, Muller comes on as a sub in the derby against Dortmund, scores and assists for the 1:2 win... Probably one of the reasons why I'll keep him at the club no matter what. I was thinking of brining in ter Stegen in a few seasons for long-term replacement for Neuer, but Strakosha's model citizen mentality may sway me in his favor... though in more short-term plans, I'm looking forward to an active January transfer window, as we'll be looking to bring a CD and a CM to replace Sule/Sanchez (latter one will be loaned out). Would be nice to compare how our sides do in each other save. And I see you next match is against us. Why you want to sell Süle? He's not the best CD, but quite solid and still young. Poor them! It will not be for the first season, but I'm eyeing Brandt as my long term replacement for Reus. Haha, ouch! Considering my nationality, though, I have to say I'm pretty happy with that result! And in my opinion, I think this result goes to show that Bayern are due for a revamp. Yeah, I'm having Brandt in my shortlist as well, and just scouted Reus for good measure... As for Sule, he wants a wage increase from 56K per week to 200K per week. He has to be Chiellini or Ramos for me to consider giving that much for him! The quarter-finals of the German Cup show some interesting fixtures up ahead - even though Stuttgart are still dead last, a red card for Pulisic helped them overcome Dortmund in a 1:2 win. Hopefully they won't make it any further! As for the January transfer window, we got some good news as Sule stopped wanting a new deal, so I only loaned out Renato Sanchez to RB Leipzig (150K per month + 100% of his wages) and we got Exequiel Palacios in his stead from River as he had a 10.5M release clause. The young wonderkid is still adapting, though, as he got a red card in his debut and it will probably take some months before he gets used to German football. We also signed teenager Pelayo Morilla from S. Gijon as he had a lowly 1.4M release clause. The Spaniard, along with 2 other nobodies (Duverne and Bellegarde from Lens) will help our 2nd team promote up the leagues. Also, I allowed Robben to leave for the Premiership, and we're even covering 50K of his wages. He wanted more first team football and it made sense to sell him. The league table shows Mainz still very close and breathing in our necks and what makes their run all that more impressive is that RB Leipzig scored 5 against them in one game! That means they conceded just 4 goals in 19 games! The player stats show that CMs are similarly back to their devilishly top scoring ways like in the Diablo tactic days, as Alaba has been absolutely lethal with 15 goals in 17 apps! On the 2nd player stats screen you can also see that IWBs also are doing the Lord's work as Vagnoman averages 8.34 rating in his few apps, and also Stark/Mbabu have scored quite a lot from the RB position. Bring on youth intake day! Started a RB Leipzig save, really enjoying how much talent they have in attack. 7 league games in and Werner has 8 goals, and Bruma has 7 in 6. Few others chipped in with 2 or 3 too. Sitting 2nd on 18pts, only loss was a 4-1 to Dortmund, Reus ran riot. Bayern signed Hector and Weigl, and have won every league game by at least 2 goals, scared to play them. I am looking to sign one or two world class names to the team in the summer...how does this team sound? For the left back I'm looking at Robertson from Liverpool or Lucas Hernandez from Atletico. Any suggestions on which one? Anyways, in the following posts I'll be dwelling more into the details. 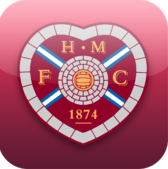 Youth intake day brought Zimmerman as the biggest talent, with Billmann also not looking bad. Then again, it will be good if I haven't dropped this save once they're ready for first team football! In the league, we finally have some cushion against chasers Mainz, and we're looking at a CL tie with Real Madrid, after eliminating Tottenham (4:2 and 2:0). The results have been decent and steady, and I forgot to mention that Robben's transfer fell apart, as he rejected a move to the Premiership! Simply my best win so far on FM19!! Almost finished my first season and things are going well. Top of the table by 4 points and in the semi-finals of the UCL, though against Madrid. Got knocked-out the Pokal by Bayern, but really can't complain. Will do a full sum-up post tomorrow hopefully. @Trent71 By qualifying to the 2019-20 UCL, my board already gave me a war chest of € 177M, so gonna be where you at soon. But I'm not going away from my own save's rules of buying young and German preferably. Guess gonna land either Brandt, Havertz, or Werner. Of your proposed squad, the only weird name for me is Dembélé. The rest is...WOW! Is the Palacios you wanna sell Ezequiel Palacios? @Pavi Nice result against Stuttgart! Did Pavard play? I am also interested how Reus' fitness is, my scouts say he's injury prone, though he doesn't seem bothered by it and plays quite a lot. I'm pretty fond of Dembele and I signed him on a free for a year-long deal Always liked him on previous FMs, hence why I arranged the deal. As for Palacios, I'm only going to loan him out during that season - preferably to a German team - so he can get used to the style here. After he started with 2 red cards in 3 games I wanted to make this deal, as he's obviously not yet adapted to life in Germany. That's why I'm signing Dembele in his stead. I'm probably going to have the team be majorly of Germans, but for now I want to test out a few names I haven't been able to so far and make some experiments along the way. So, as April started, we're already done with our Summer signings - Ruben Dias (Benfica, 60M). We met his release clause and he can be a monster of a CD for us! Virgil Van Dijk (Liverpool, 75M+) The Dutch international will replace Sule, who started moaning about a new contract once more. Our new left back will be... Adrien Rabiot (PSG, 100M). I think he can be great success in that position, specially considering it's an IWB and he spends most of his time in the center of the pitch. Mousa Dembele will arrive on a free from Tottenham to provide cover and depth, while Emre Can was another key signing, as we met his 50M release clause - the German international is regarded as homegrown at Bayern, hence why the move for him was so important. Originally, I wanted to take Toni Kroos, but so far he's not interested in coming back. Paulo Dybala is the last and probably most important piece of the jigsaw, as he'll replace James on the AMC position. We splashed out about 150M Euro for his services. That leaves us with a 100M still to spend and about a 1M Euro freedom in wages. I probably won't be spending all that much in the future season, as I'm going to wait and see how the monthly installments influence our finances. Btw, anyone watched Hannover - Bayer on the weekend IRL? Did you love Hannover's snow goal? The longest Reus has been injured this season is 3 weeks. But mind that I do rotate a lot and I pay a close attention to Reus' reports from my sport scientists. On the pitch he has been fastastic. We are in April and he made 30 appearences for 11 goals and 7 assists playing as a Wide-Playmaker. Well, it has definitely been a productive season, winning the Bundesliga in my first year trying. But first things first, there was no major addition to the side during the winter transfer window. I brought in Nicolas Kühn from Ajax and Marc-Oliver Kempf from Stuttgart. The latter being a young promising German CD and listed for only € 3M was a no-brainer. While Toprak left for the Saudi league. The squad for the second part of the season looked like this. In the league, we battled with Bayern until the last 4 or 5 fixtures when we managed to gain some advantage. Mainz and Freiburg achieved both an incredible season qualifying for the UCL and Europa League. We also managed to do a very good UCL campaign and were eliminated only by goal difference by title holders Réal Madrid, who, weirdly enough, played with a strikeless 4-2-4. Never seen such a weird tactic by an AI manager. In terms of single players, I have to salute the performances of captain Marco Reus and Abdou Diallo. While wonderkids Jadon Sancho, Sergio Gómez, and Luca Unbehaun are developing well. As for next year plans, my board gave me € 177M to play with and I have € 25M (per year) as free wage budget. I want to bring in at least one between Brandt, Havertz, and Werner. The last one is the least of the priorities as I already secured the signing on a free of Johannes Eggestein and Alexandre Isak will be coming back from loan. This one, it's a 4-4-1-1. What I like is its flexibility, as you can see it either as a low 4-2-3-1 or as 4-4-2 with the AM pushing high. I like the configuration with two DMs and have a lot of pitch depth in front of the midfield. SK-D: Just so he rushes out more often than a normal goalie. FB-S: He's asked to sit narrower to defend the half-space as the wider space is covered by the Winger. CD-C: Is the slowest of the defenders hence I want him to set the defensive line. BPD-D: Asked to press less to keep the defense's line. WB-S: He provides width on the left flank. VOL-A: He acts as BBM, and attack the box with late runs, while when we have possession he helps to connect the two flanks. DLP-D: Nothing special, he stays to protect the defensive line and to recycle possession. W-S: Gives width and put in low crosses into the box. WP-A: The real creator of the team and a goal threat, he dribbles and put in through passes and is always at the scoring end when crosses come from the opposite flank. AM-A: Both a link between the midfield and the striker and often position himself as a second striker. PF-S: I prefer this role than a DLF because he is not asked to hold the ball and is more compatible with a direct style. The support duty is to be sure he is involved in the passes play. Sorry to everyone for going off topic with this tactic digression. I have started a save with RB Leipzig. I managed the team after the first season, where they became fourth. I really enjoy the save so far. I have focused alot on the staff, and optimizing that. My tactic is 442, and full gegenpress with very direct / fast play. I will only buy players under 23, and i will mainly use the excellent academy in Red Bull Salzburg too feed from. I have sold Kampl, Forsberg, Ilsanker and Gulasci, all my ageing players. I have bought all the good players from Salzburg (Håland, Xaver, Onguene, Diadie, Hannes Wolf, Dominik Sza..). I loan all my talented players out to them aswell, and when i buy players from them i give them a minimum of 10% of the next fee. I also wanna buy players with a good work rate. How much did Haland cost you? Tempted to bring him in to rotate with Werner as he looks quality. Good luck! Fun team to play! I'm interested in seeing how they fare after they sold these two players to you and potentially when they lose Bailey as well. IRL, I think it would be hard for them to cope with that loss, even though they'd have a buttload to spend...the AI isn't very smart in investing the money back into talent of the same caliber. Think i'm gonna start as Dortmund as well..
Around 20m£ - with 15% of next sale. He rotates with Werner and Poulsen. Quadruple in the first season... how can you top that in the following seasons? The game itself was won in style and in special CL fashion! You can check out the player stats here and there. Timo Werner was a phenomenal beast and Batista Meier may have beaten Havertz on assists, have I played him more! One of the potential young purchases was pretty right when he though he won't get a lot of playing time! A fantastic season alround and looking forward to the Summer dealings! Wow, a winner at the 92nd minute!! Kudos on the Quadruple! @Trent71 Did you start your save with the older 19.1 database? I noticed Volland is slightly weaker in the 19.3 database. I always rationalise usually using the original DB as added realism - not having players you wouldn't have irl. I only tend to go on updated databases if a player's had an upgrade (for example a planned Samp save with Quagliarella being upgradeD). Best striker I've used in FM19 by far. Getting them two so cheap feels a bit like loophole though , now that they both cost double figures. The Zagreb researcher obviously felt Marin was going for too cheap and Almiron is now a Newcastle player. Disable first window transfer budgets - I spent about £15m + add-ons for Almiron with Dortmund, and Marin usually signs a contract with a £4m release clause, which is at least slightly more than the pittance people can get him first window. I was referring to a save I had on 19.1 or whatever its called - documented on page 4 of this thread actually - where I got him from Atlanta. Basically I was saying what I'd offered, if he'd lived up to expectations / if I hadn't messed around tactically (bought him to play SS then changed to a different tactic when he joined) he would've cost similar to what Newcastle paid in real life. If Wendell's good enough for first choice, there are a few decent German LBs out their - Horn from Köln would be a more offensive option available quite cheap, or Günter from Freiburg. I tend to switch between attribute masking on and off save to save. Given how fast AI moves in the first window having it on can put you at a disadvantage, but given I usually untick first window (unless playing as Man Utd where I know the squad) it doesn't affect me too much. So decided to start a pre-season with both Leverkusen and Dortmund and then play through the transfer windows and pre-season before making a choice between all of my possible options. Began with Leverkusen. Priority number one was a proper deep-lying playmaker and a back-up left back. Initially, I wanted Horn or Hector as a left back, but then I remembered (And kind of stumbled) upon Itter from Wolfsburg. Compared him to the two-year older Horn, my choice was made quickly. While Wolfsburg refused to budge, Itter handed in a transfer request, allowing me to get him for 15, 5 million euros. I like. For my deep-lying playmaker, I went in for Exequil Palacios. With the interest of Juventus in him, I decided to act fast and put in an offer of 5 million. To my own surprise, they accepted. And now, for 5 million euros I have a midfielder that can turn world-class. Next up was a central defender. 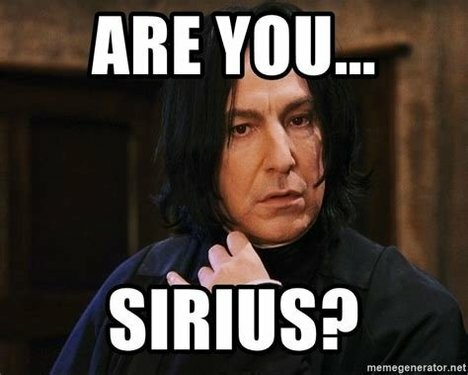 Why I hear you all ask. Tah, in my opinion, is the only worthy and good centre back that I can rely on. Jedvaj has concentration problems and looks more like a back to me. Retsos isn't all that physically strong, which isn't bad per say, but his concentration doesn't compensate it. Bukusu wasn't any ready and the brothers Bender are too slow. Also got in Fruchtl from Bayern hoping he'll develop well. If he doesn't, the return of Leno or Ter stegen would be the ideal goalkeeper. Managed to get in Vagnoman too at right back for around 10 million. Hoping he'll develop well. He will definitely get the start over Weiser for the time being. Terminated Pohjanpolo's and the goalkeeper contract (Forgot about his name), off-loaded Dragovic, Kohr and Lars Bender with Sven Bender probably following soon. Ultimately, as far as my first team goes, I'm really happy. Especially my front 4, with Brandt at LW, Haverts at CAM, Bailey at RW and Paulinho as ST hold the future. Havertz can be the iconic man for years to come and I hope I can hold on to him. Only looking to bring in Herta's Stark still and Berge from Genk to compete with Palacios as Deep-Lying Playmaker. Only 3 games left in pre-season and I'll try Dortmund. I reckon I'll be starting with Leverkusen soon too. Dunno if I should go with the 19.1 or 19.3 database though. It seems like the 19.1 is better for bringing in those young prospects. @RVP32 I'm guessing you have started with the 19.1 database too? I started with 19.3 but deleted the future transfers of Arp and Pavard to Bayern.